Getting tetra-packs or juice from nearby shops can be a convenient option but making fresh juice is definitely the best and healthiest option. And unlike what you might think, making fresh juices will neither take you hours or require tons of effort. Get the best juicer in India, and this tedious task can be a cakewalk and in this article, we’ll tell you exactly how and where to get the right one. 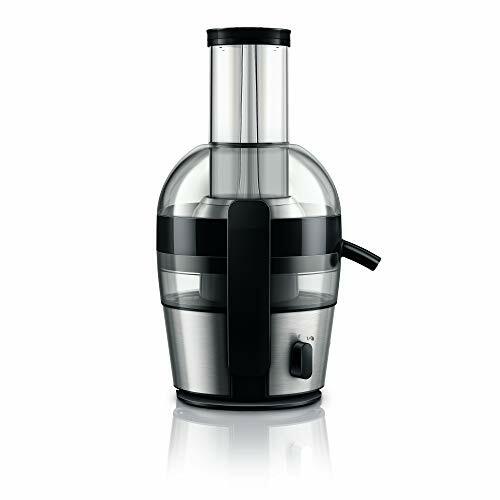 Philips Viva Collection HR1863/20: This Philips Juicer can extract 10% more juice than most juicers in the same price range with its upside-down sieve and needs no pre-cutting of fruits like apples, beetroot etc. due to the XXL Feeding Tube. It can be cleaned in under a minute with the QuickcClean Technology and its aluminum build ensures it will last you for years to comes. This is one juicer, you will never regret buying. 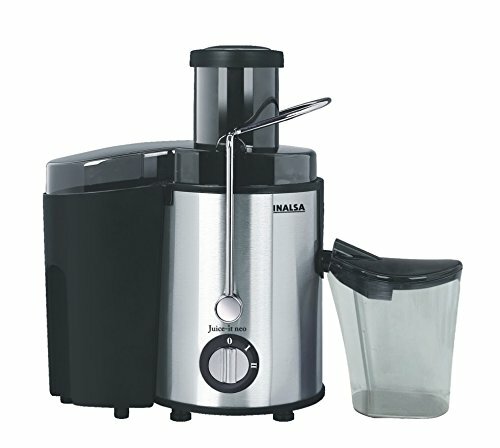 Inalsa Juice it Neo: Looking for a juicer something on the cheap? With the Neo, you can enjoy your favorite fresh juices at less than Rs. 3,000. Looking for something that is quick and easy so you can prepare fresh and healthy juices for your family effortlessly early morning? Say hello to the Philips HR1863. Capable of churning out 700-watts of power, the Philips Juicer can juice even the toughest of fruits without leaving behind a drop. So how does it do that? With the help of its advanced extraction system and an upside-down sieve that help extract 10% more than other high-end juicers. And for that you do not have to waste time cutting and chopping bigger fruits like apples, carrots etc. thanks to the 75mm extra large feeding tube (just drop them in whole and you are good to go). All of the juice neatly falls into the large 800ml juice jug without any spills or drips on the counter. Another big advantage of this juicer is that it is more efficient than other centrifugal juicers when it comes to extracting juice from leafy green or broccoli etc. Don’t you just hate it when the pulp ends up all over the juicer lid, blade, body etc.? Not, with the Philips. Here the pulp goes exactly where it was meant to, the pulp collector. And this pulp collector can collect pulp of about 2-liters of juice at a time without any need to clean it. Plus, since the pulp collector is see-through, you will know exactly when it needs to be emptied out eliminating any kind of guesswork or need for constant checks. With the QuickClean Technology, the juicer can actually be cleaned in under a minute. No more rinsing and scrubbing. Just add in some water, run the mixer and voila, within a minute, your mixer will be just as clean as it was before. But how does it really happen? It is mainly down to the roundish design of the mixer and other smooth surfaces like that of the sieve. But in case you do find any remains on the sieve, it can be simply wiped out with a kitchen sponge (hassle-free cleaning, just the way we all like it). The aluminum build gives the juicer unmatched strength (enjoy healthy homemade juices for years to come). There are also anti-skid feet at the bottom to prevent the juicer for slipping and sliding during the juicing process. One of the few drawbacks of this juicer is that you do not get any control over the speed of the juicing. Also, since it is a centrifugal juicer, it can be a little noisy (though lesser compared to other centrifugal juicers). Plus, it can also heat up the juices a little killing some of the nutrients, while the oxidation makes it frothy. The drawbacks aside, when it comes to centrifugal juicers that can get the job done quickly, efficiently and are easier to clean, this Philips juicer stands head shoulders above the rest. Where Centrifugal Juicers fail, Slow Juicers or Cold Press Juicers like the Kuvings Professional excel. So if you have a higher budget, this one is a no-brainer. Model Type : Kuvings C7000 (Fantom Black Gloss) | This Cold Press Juicer is capable of juicing Fruits, Vegetables, Greens and also making Nut Milk out of Almonds, Cashews and other nuts. C7000 is a 4th generation model with an improved auger for faster juice extraction. It also comes with the updated juicing bowl design adding to the strength of the juicer. The product is made out of food grade BPA plastic for enhanced life and hygienic juice. Patented Large Mouth (76mm) : Enables to load whole ingredient. Loading a whole fruit makes juicing convenient and fast | Comes with a safety lock precaution, so the juicer will only start if installed properly | Compatible with Smoothie and Ice-Cream attachments (to be bought separately); Make delicious recipes using these attachments. With the Kuvings C7000 juicer, you can enjoy more nutrient-rich, low-pulp, and frothless juices from not just fruits and vegetables but also leafy greens. And if that didn’t already leave you impressed, you can make your favorite almond milk right in your kitchen, or use cashews and other nuts as well. But what is the secret behind its efficiency? Secondly, it is equipped with the patented JMCS Squeezing technology that leaves little to no juice behind (after all, who doesn’t love getting more from little). Lastly, there is also the Auger (juicing screw) made of BPA-Free Ultem that gives you the best yield and keeps pulp to minimal. You save time on cutting and chopping of fruits or vegetables as most of them will easily fit into the large 3-inch wide feeding tube. And it does all that juicing while creating the least possible noise (peaceful and efficient, just the way a juicer should be). The Kuvings C700o isn’t your average joe. It also comes with a smoothie attachment and much-loved frozen dessert attachment for ice-creams, sorbet etc. To ensure safe operation, the juicer only starts when each and every part is installed correctly. Just like the juice jar, there is also the pulp jar which conveniently catches all the pulp coming out via the pulp outlet and can be emptied out anytime without removal of any interior parts. Compared to previous versions of Kuvings, the C7000’s bowl has lesser rubber parts that help reduce leaks and, in turn, make cleaning easier. But what really makes takes the cake here is the free cleaning set you get with the Kuvings. It comes with a rotating brush and a normal brush to help you clean the inside and the various parts like the filter and attachments. The ABS plastic housing gives it not only durability expected from any high-end juicer but also a pristine finish that fits in well with any kitchen décor (sure to catch a few eyes). Lastly, it can be more tedious to clean as compared to the Philips Centrifugal juicer and is also heavy so moving it regularly won’t be the best idea. Lastly, it can be more tedious to clean as compared to the Philips Centrifugal juicer and is also heavy so moving it regularly won’t be the best option. Works more efficiently with leafy green and even lets you extract milk from nuts like almond etc. Yup, the Kuvings isn’t cheap but the unmatched juicing capability of this slow juicer means it can also be used at juicing corners, cafes serving fresh fruit juices etc. Need a multi-purpose juicer? 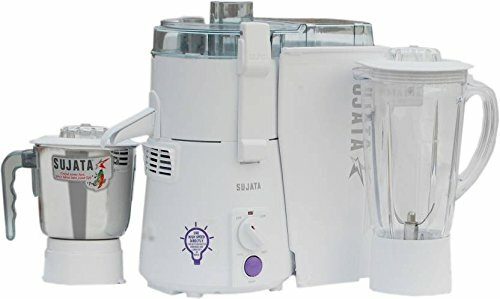 Sujata is India’s very own brand and isn’t just great for juices but also for grinding and mixing masalas, idli batter etc. One major advantage Sujata gives you over other brands is that you get speed control. So whether you like to do it fast or slow, you are absolutely in charge. Backing those high speeds up is the powerful 900-watt motor which means you can juice through most ingredients in a matter of minutes. But is the juice any good? Absolutely. To ensure you juices aren’t too pulpy and the fruits are efficiently juiced leaving nothing behind, it comes with a special honeycomb filter. Also, the 2200rpm operation helps to retain the actual flavor and aroma from the fruits so your juices both taste and smell fresh. But in case you are more of a shake and smoothie person (all gym freaks are), the 1.5-liter blender jar is exactly what you need and will churn out smooth, consistent protein or fruit smoothies all day long. But there is more you can do with the Powermatic like even grind urad daal and prep batter for idli and vadas or even grate carrots etc. thanks to the 1-liter wet and dry grinding jar. It can also help you grind up some quick green mint or tomato chutney to treat yourself and your family/friends to some lip-smacking pakodas or samosa. To give you uninterrupted years of service with zero maintenance cost, the Powermatic blades are built using stainless steel which ensures no rusting. The ABS housing itself is quite durable and can easily handle the daily kitchen wear and tear without breakage. Plus, it also makes the juicer grinder shockproof. Operating it all full speed can get noisy especially if you are dry grinding. While the pulp collector does a great job of removing pulp, at full speed the splatter can dirty various components which need to be hand-washed making the task time-taking. There is no overload protector. Also, it isn’t as efficient as a traditional juicer would be which means your juice can be comparatively pulpy. Need a mixer grinder with decent juicing capabilities? Check out our top picks for 2019 here. 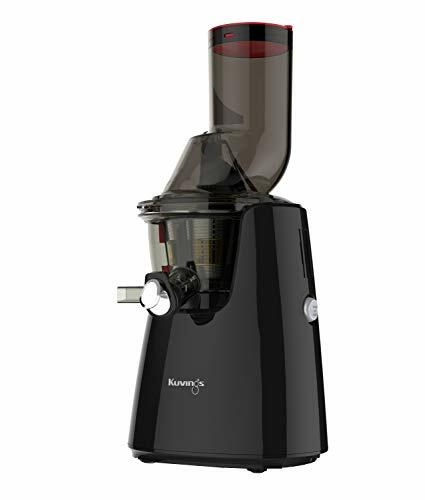 Not exactly the most efficient of juicers but if you love the occasional fresh juice and want a high utility appliance that can also grind and mix, the Powermatic is tailor-made for you. On a tight budget? No Problem, you can still enjoy your favorite fresh juices with the Inalsa Juice it Neo. Speed control isn’t common in most typical juicers but that is where the Inalsa standouts out. With 2 speed options, you get the ultimate control over the juicing, in turn, giving you better yield out of both smaller and larger fruits and vegetables. And while 500-watts may not be as high or efficient as some out other picks, it does a pretty decent job of juicing fruits like apples, oranges etc. The 65mm or 2.5-liter feeding tube can easily fit in medium-sized apples, beetroot, peeled oranges, carrots etc. without needing any cuts. The brush stainless steel build adds some bling to the kitchen while giving the juicer itself top-notch durability so your investment remains strong and lasts you longer. But a strong body is nothing without a durable motor and this is why the Neo has also been equipped with an overload protector. Plus, there are anti-skid rubber feet at the bottom which keep the juicer static and prevent vibration (even at high speed) from sliding or dropping the juicer. The 1.3-liter pulp container can be attached and detached in seconds for easy cleaning while the safety lock on the juicer lid ensures nothing spills out. Also, the 500ml juicer jug fits perfectly well at the nozzle to prevent spills. Further, the nozzle can be tilted down for pouring and up once done (another great feature that ensures no spills and drips). On the downsides, on full-speed, a lot of the pulp also splatters on to the top lid, blade, sieve etc. which the washing very tedious. Also, the mixer is quite noisy. The 500-watt motor is also not the most powerful of the lot which means juicing is as efficient as with the rest. Plus, at higher speeds, the heat will diminish some nutrient value of the juices while frothing on top due to oxidation is common with centrifugal juicers. From one of India’s top brands, comes a slow juicer mixer that is ideal for anyone that wants to enjoy the benefits of slow juicer with paying the big bucks. Though not the workhorse like the Kuvings, 150-watts is sufficient power to give you ample juice from both soft and hard fruits and even leafy veggies that are cut into smaller pieces. The special squeezing auger rotates at a sufficient 45rpm churning out juices intact with all its nutrients without any oxidation, so no froth on top. There is also a wiper that covers the filter and just as the name suggests, wipes of pulp off the filter to prevent it from clogging. Thanks to the cleaning brush you get with the juicer and the large pulp container, cleaning becomes a task you will not dread anymore. You can also run a rinse cycle with plain water 2-3 times to get rid of any remains and leftover juice before your next juice cycle. Lastly, the spout comes with a cap. So once all the juice has been poured out, you can conveniently close the spout to prevent spills. The high-grade plastic used in making the screws and strainers can easily handle the wear and tear of juicing for years (so you can get the best bang for your buck). But you can enjoy more than just juices with the MJ-L500. The frozen attachment is a pretty neat way to prep some quick yummy dessert on the go. Freeze up cut pieces of the fruit, run them through the juicer using the Frozen Attachment and give your taste buds the chills as temps cross 40-degrees in summers. The fruits need to be cut into smaller pieces before being juiced as the feeding tube is a small one. Also, it does not give you milk from almonds, cashews and other nuts like the Kuvings. Lastly, it is also not as fast the Kuvings, mainly because of the lower but, more importantly, gets the job done effectively. It does not extract milk from almonds, cashews etc. Fruits and vegetables are very important for your good health. We all have been listening to this one line since our childhood and which is even true. But have you ever thought of making the best use of them that would be more beneficial for your health and body? Well, the answer is JUICING. Juicing is just so simple. Get a juicer and off you go. The process helps you to easily ingest essential vitamins and minerals your body need. Just remember a few basic rules of juicing and it will taste amazing. Regular juicing can help you in improving your overall health. Once you start juicing, it will make you more conscious about nutrition that will ultimately help in losing your weight. If you have freshly made vegetable juice, it will keep your stomach full. In general, a number of people make the price of juicer ‘the most important factor’ while buying one. That is one of the important factors but not the ONLY one. There are some of the other important things you need to take into considerations while buying a juicer. There’s a myth that all juicing machines juice everything but that’s not actually the truth. There’s no such universal juicer that can provide you with all types of produce. So before you select the type you need to learn about your juicing habits and get the best unit according to your needs. We’ll be discussing the main types of juicers after this section. If you want some quick and effective results, make sure you’re buying a machine that comes with at least 450-500 watt motor. However, a 250-watt extractor is a good option for entry level juicer. Can’t spend your precious time and effort on washing and cleaning the juicer and its part? Get a juicer that is dishwasher safe. Although, every type of juicer needs some kind of cleaning and once you become habitual of it, clean-up job won’t look like a headache. Also, there are some juicers that come with a bit complicated mechanism that might make juicing a time-consuming task. Choose smartly. Well, the quality of juicer depends on its durability. A good quality juicer may not leave your side for 5-15 years. However, some manufacturers give a longer warranty just on the motor. Since nowadays, the market is full of different brands and models; warranty period surely becomes one of the important deciding factors. If you’ve recently begun this interest in having juices, you can get an inexpensive model to see whether this “juicing” thing will work for you or not. Later on, you can invest in a high-end model that will last for years. All the juicers come with a powerful motor that makes them a bit noisy. In fact, those who produce less sound generate around 80 dB noise. And the loudest juicers might generate around 100 dB noise or more. Once you get this habit of having juices regularly, you’ll never want to miss it even for a day or even when you’re traveling somewhere. There are some lightweight models you can easily carry around while moving out. So, you’ve learned what you need to consider before buying a juicer. And buying one now seems like a cake walk. Wait. The challenge is not over yet. Selecting the right type (even if you know about the features) can be a dismaying task. Given below are the different types of juicers that will help you in figuring out the right type you need. What if I suggest you a good kitchen juicer that does its job quickly and with great ease? All sorted, right? Centrifugal juicers are the best option when it comes to a quality juicer for your kitchen. These bladed juicers make the best use of their sharp edge to cut and pulp almost every type of fruit that you add and provide you with the perfect pulp for smoothies, stuffing, and stocks. Due to high RPMs, you’ll get your juice really fast. An amazing option for the beginners who are not sure if juicing is right for them. These juicers are quite easy to clean. They cannot juice everything. You might face problems with leafy greens and wheatgrass. They are a bit noisy. Due to high RPM, they result in heat that makes the juice get oxidized faster. These juicers are mainly known for their ability to produce quality juice across a wider range of fruits and vegetables and are highly preferred by the enthusiasts. Well, they are a bit costly so need to choose the right one that is highly rated and is best for daily juicing. As compared to centrifugal juicers, they preserve more nutrients. These juicers produce no heat. They can juice more produce that even includes wheatgrass and berries. Quite expensive for the beginners. The juice making process might take a longer time. You first need to cut and then make the juice so that it fits in the chute. They are quite heavier than the centrifugal juicer’s counterparts. Do you need a juicer that not only crushes your fruits and veggies but also slowly separates the juice from the fiber? You’re reading the right option. These juicers have two augers and both of them intertwine and work together slowly. Whereas fast juicers break down the ingredients and drain the essential nutrients. These juicers crush the deepest parts of the fruits and vegetables and make the most of it. You’ll end up with dry pulp leaving no drop unused. You can keep the juice produced from these juicers for around 3 days in the fridge. These juicers are really very expensive. Due to low RPMs, the extraction process if slow. This particular type of often ignore while discussing the types of juicers but is one of the valuable options in the collection. There are some models that can work without electricity and some can be manually operated thus, end up with fewer complications and necessities for juicing. You just need to grind your fruits and vegetables using a blender and wrap them in the given juice cloth. Then you need to keep that cloth in a stainless steel tray. Then the tray is compressed and the cloth separates the juice. During the last step, the tray is locked and the produce is juiced. The juicers retain a maximum amount of nutrients. The shelf life of juices is long when stored in the fridge. The downfall of using this juicer is that they are terribly expensive. Ah! Finally, I know everything about how to pick the best juicer for me. If this is what you’re thinking of, just wait because one more important thing is left i.e. selecting the right brand. Check and compare how a brand is different from the other and make the best choice. All in all, this was your guide to buying the best juicer. Just remember, juicing is not a diet but a lifestyle, in fact, an amazing lifestyle if practiced daily. And you cannot go wrong with your lifestyle, right? So, keep all the pointers in your mind and pick the best. Welcome to the world of juicing.